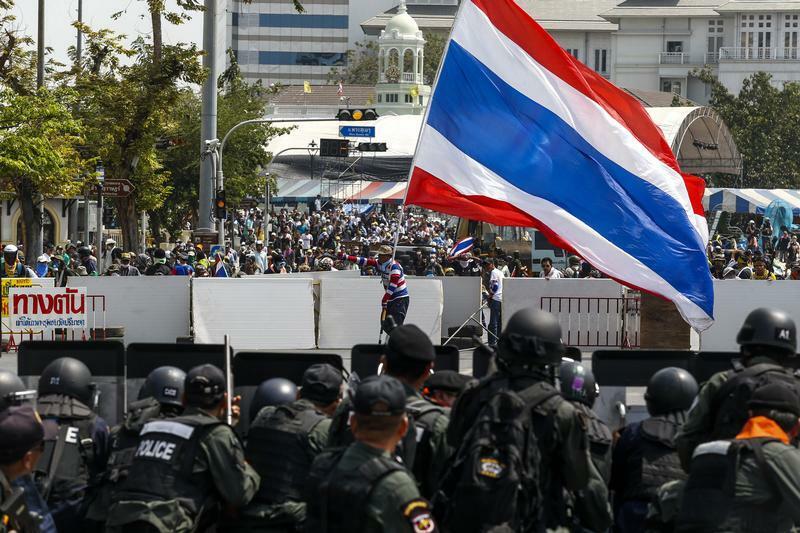 Thailand’s telecom operators are relying on yield to defy the country’s political turmoil. Escalating protests and low valuations make it an odd time for a financially healthy company like Jasmine International to pursue a $1.4 billion spinoff. Though the plan to give its broadband infrastructure assets a separate listing makes financial sense, investors may need to be tempted with sweeteners. Bangkok-listed Jasmine plans to sell its core 610,000-kilometre optical fibre cable network and 16,000 access nodes into the fund and then lease them back. The operator will retain a one-third stake in the newly listed fund. Jasmine will use the proceeds to expand its broadband business in a country where operators face minimal competition, and penetration for households was below 23 percent in 2012. The spinoff plan follows two similar Thai infrastructure fund offerings last year. Rival telecom operator True Corp, majority owned by Thai billionaire Dhanin Chearavanont, raised $1.8 billion in December by spinning off a hodgepodge of towers and cables as part of a cash call. In April, Skytrain operator BTS Group Holdings raised $2.1 billion in Thailand’s largest initial public offering. Both have underperformed the country’s benchmark stock market index since they were listed. Jasmine faces its own hurdles. The fund’s hoped-for market value of $2.1 billion looks punchy for assets that represent half of the group’s total book value as of June, according to a company filing. Jasmine’s own market capitalization is barely $1.7 billion following an 8.9 percent slump in the local stock market since Sept. 18, when political protests against Prime Minister Yingluck Shinawatra’s government began to gain momentum. A healthy tax-free dividend will help. The fund will offer a yield upwards of 6.6 percent, according to a person familiar with the matter, well above the current 3.8 percent yield on 10-year government bonds. But for Asian companies seeking to monetise cash-generative assets, it’s a race against the clock. The expectation of rising interest rates dampened demand for last month’s offering of HK Electric, the utility backed by Asia’s richest man Li Ka-shing. If Jasmine wants to defy Thailand’s political paralysis, it may need to do more to stand out from the crowd. Thai telecom operator Jasmine International has held talks with potential cornerstone investors ahead of an initial public offering of its broadband internet business, according to a person familiar with the situation. Jasmine is on track to raise as much as 46.7 billion Thai baht ($1.4 billion) by listing a fund containing its broadband assets during the second quarter or earlier, the source added. The company will sell its optical fibre cable and access nodes to the fund and then lease them back. Jasmine will retain a one-third stake in the fund. The assets to be spun off had a book value of 10 billion baht ($307 million) as of June 30 2013 or half of the group’s total, according to a company filing. Jasmine International has a market capitalization of $1.7 billion. The company is 25.8 percent owned by Thai millionaire Pete Bodharamik. True Corp, majority owned by Thai tycoon Dhanin Chearavanont’s CP Group, raised $1.8 billion in December through a similar listing of telecom infrastructure assets. In April, Skytrain operator BTS Group Holdings raised $2.1 billion by listing infrastructure assets in Thailand’s largest IPO. Thailand’s benchmark SET index has fallen 8.9 percent since Sept. 18 amid the country’s political unrest. Thailand’s 10-year government bonds yield 3.8 percent. Morgan Stanley and Bualang Securities have been appointed as underwriters for the Jasmine infrastructure fund.